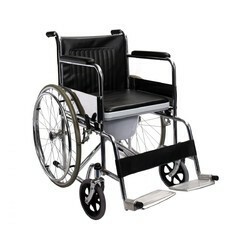 We are a leading Manufacturer of transport wheelchair, travel wheelchair, hospital wheel chair, powered wheel chair, custom wheelchairs and sports wheelchair from Chennai, India. Weight Capacity 351 to 450 Lbs. 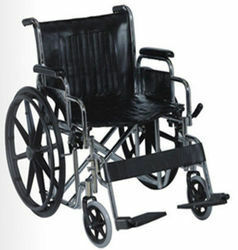 We offer custom/ tailor made Transport Wheelchair for individuals. We analyze the requirements with the help of our efficient representatives as per the user's disability, requirements and usage area. Seat Width Standard 17" to 19", Narrow 15" to 17"
We are leading Manufacturer, supplier and Trader of Travel Wheelchairs are developed using premium quality MS steel pipe, stainless steel pipe and aluminum. 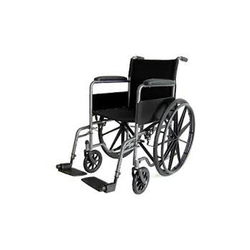 We are leading Manufacturer and Supplier, Trader of wide range of Hospital Wheel Chair in Chennai, Tamil Nadu, India which are suitable for indoor as well as outdoor purposes. 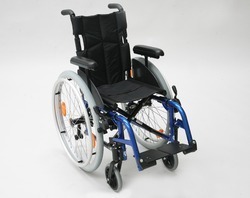 Powered Wheel Chair model is designed to assist the disabled person to stand. 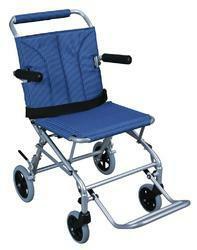 Weight Capacity 251 to 350 Lbs., Upto 250 Lbs. 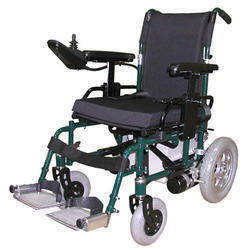 We are leading Manufacturer , Supplier and Trader of Custom Wheelchairs to meet the varied needs of the individuals. 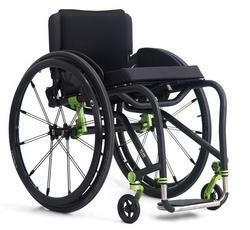 We offer Sports Wheelchair of smart design regarding to maintain sports trend of players on court. We are leading Manufacturer, supplier and Trader of Folding Travel Wheelchair are developed using premium quality ms steel pipe, stainless steel pipe and aluminum. 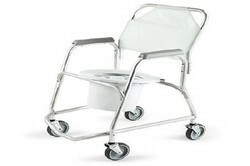 We offer a vast range of Portable Commode Chair which are specially designed for aged and physically challenged people. Wheels 4” , 2 brake with wheels , 2 without brake wheels. Seat - commode seat with collecting pan. Seat height - adjustable type (suitable adjustment for western commode). it can use bathing / commode. We are leading Manufacturer, Supplier of Light Weight Folding Wheel Chair to suitable for indoor and outdoor purpose, easy handling to take outside. Seat Width Narrow 15" to 17"
With enriched industrial experience and knowledge, we are providing an excellent range of Children Wheelchair. 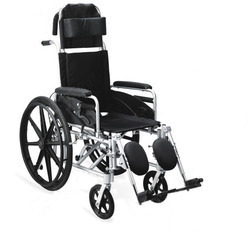 Seat Width Standard 17" to 19", Wide 19" to 24"
Weight Capacity 351 to 450 Lbs., 451 to 650 Lbs. 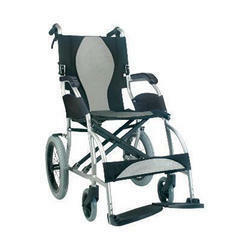 We are passionately engaged in offering an exclusive range of Wheelchair Heavy Duty. Seat Width Youth 10 to 15, Standard 17" to 19"
Weight Capacity 251 to 350 Lbs. 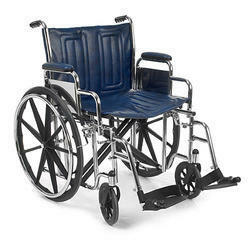 With enriched industrial experience and knowledge, we are providing an excellent range of Wheelchair Detachable Footrest. 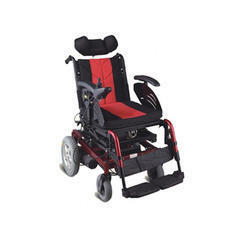 Reclining High Back Wheelchair are most suitable for patients with paralysis or other rehabilation diseases who need support and are the most economical, high-quality wheelchair on the market today. Seat Width Narrow 15" to 17", Standard 17" to 19"
Our company has gained name and fame in offering Aluminum Wheelchair to the clients. 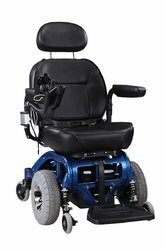 With the aid of our technologically advanced production unit, we are able to offer Electronic Wheelchair at economical prices. 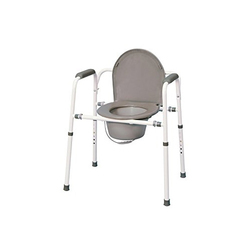 Matching up with the ever increasing requirements of the customers, our company is engaged in providing Commode Wheelchair. Weight Capacity Upto 250 Lbs., 251 to 350 Lbs. 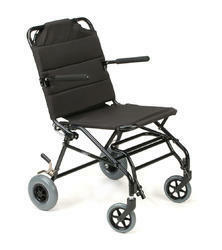 Seat Width Standard 17" to 19"
As a specialist in this domain, we are offering a wide range of Shower Chair. 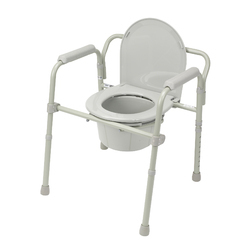 We are an illustrious organization that is engaged in manufacturing and supplying high quality Adjustable Commode Chair. 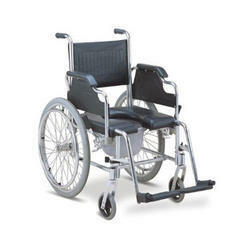 Offered by us is a wide gamut of Handicap Wheel Chair, which is manufactured using quality raw material. Delux/Power Wheel Chair offers top speed of 7 Mph (10 Km/h), and wheelchair's batteries offer drive range of 20 miles (30 km). It is manufactured with emphasis on safety, reliability and comfort. This product provides solutions in vibration, speed, slope handling, terrain driving, center of gravity and night driving. Design helps to drive across inclines with in 15 degrees. 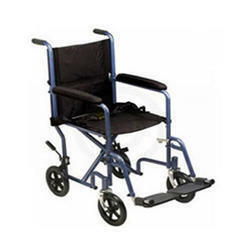 Split frame thus reduces risk of accidents for an electric wheel chair. Looking for Wheel Chair ?